I was recently invited to a mango-themed evening meal and masterclass by Suda, a Thai restaurant just off St Martin’s Lane, near Covent Garden. The mango dishes and demonstrations were lead by Kessuda Raiva, Executive VP of S&P (who own a number of restaurants and food businesses in Thailand as well as Patara and Suda here in the UK). She was helped by Saipin Lee, S&P’s regional manager for UK and Europe. We enjoyed some delicious Thai dishes including green mango salad with crispy fish, roasted duck breast red curry with mango and tomatoes and golden fried sea bass fillet in batter with mango and Thai herb salsa. These are available throughout June, on Suda’s special mango menu. My favourite, as I expected it might be, was Mango Sticky Rice, a dish I adore. Here is the recipe for Mango Sticky Rice. I have rewritten the instructions to make them clearer. Soak the glutinous rice for 6 hours (or overnight). Drain. Wrap rice rice in a clean muslin cloth and steam for 15-20 minutes until rice is cooked. *see note. Boil 3 tablespoons coconut cream. Add 1 pinch of salt over low heat. Set aside. Dissolve 1 cup of sugar and 2 pinches of salt in 1 cup of coconut cream and cook on a very low heat until the sugar and salt dissolve. You may also add pandan leaves for flavour, if you like. Remove from the heat, stir in the cooked sticky rice and mix thoroughly, cover and let stand for 10 minutes. Then mix again. Peel and slice ripe mango. Place sticky rice on a small plate and top with mango slices. Spoon the additional coconut cream over the rice and mango. Note: You can also cook the sticky rice in a microwave. Pour boiling water over uncooked rice, to about an inch over the surface. Stir occasionally, during five minutes, then drain. Add clean warm water to cover the rice and microwave on high for approximately 5 minutes. Remove and stir. If the rice is still hard, microwave for a further 3 minutes. Kavey Eats attended the Suda Thai mango dinner and master class as a guest of the restaurant. 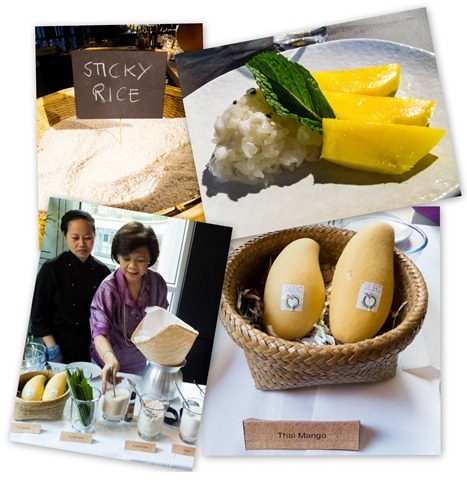 8 Comments to "Suda Thai’s Mango Sticky Rice Recipe"
Mmmm I am so jealous of your mango feast! Obsessed with Thai/Indian mangoes at the moment. This looks delicious, must try soon. I still need to write my review of Suda Thai. Yep, used Picasa as per your recommendation, Helly. In this case, I went for the skewed images, as it was default option and I was still learning. For upcoming posts (sitting in the queue to post) I’ve gone for the rectangular style I was more interested in. Thanks again again again for the reco! Hope he likes it. I need to get me some of the right kind of rice so I can try this at home ASAP. Finally, a recipe with pandan. I love Mango Sticky Rice. I first tasted it in Winston-Salem, NC in a tiny excellent Thai carryout. It was lovely. I have never tasted the flavor of pandan again. Most recipes do not include pandan. It took a while and a trip back to NC to figure out about pandan. Then finding it in a store was difficult – frozen, not so good; dyed green drops, not so good plus a funky color. I run a farmer’s market and one of my farmers just showed up with a pandan plant and I still didn’t figure out how to use it. Now I know! Thanks very much.